Oklahoma City-based Devon Energy Corporation’s fourth quarter ended on a positive note, with $331 million in net earnings for the last three months of 2016, up from a loss of $4.5 billion for 2015. Devon’s strong earnings exceeded Wall Street’s analyst consensus estimates by 20 percent. The company highlighted its increase in the Meramec drilling inventory by 40 percent; successful staggered spacing tests in the Eagle Ford play area; and a potential expansion for Leonard Shale and Delaware Sands resources. Devon’s reported oil production averaged 244,000 barrels per day in the fourth quarter of 2016. With the shift to higher-margin production, oil accounted for the largest component of the company’s product mix at 45 percent of total volumes. Devon’s total production exceeded its midpoint guidance by 2,000 oil-equivalent barrels (Boe) per day during the fourth quarter of 2016 to average 537,000 Boe per day, according to a company press release. The majority of the company’s production was attributable to its U.S. resource plays, which averaged 396,000 Boe per day during the fourth quarter. Domestic production during 2016 benefited from drilling activity that achieved the best new well productivity in Devon’s 45-year history. Led by results from the STACK, Delaware Basin and Eagle Ford assets, the company’s initial 90-day production rates in the U.S. increased for the fourth consecutive year, advancing more than 300 percent from 2012. The substantial improvement in well productivity was driven by activity focused in top resource plays, improved subsurface reservoir characterization, leading-edge completion designs and improvements in lateral placement. In Canada, Devon’s industry-leading Jackfish complex was stellar, delivering impressive results for the company’s heavy-oil operations. Devon averaged 139,000 barrels per day, delivering a 14 percent increase compared to a year ago. The company’s proved reserves totaled 2.1 Boe barrels at the end of 2016. That’s a three percent increase over 2015. 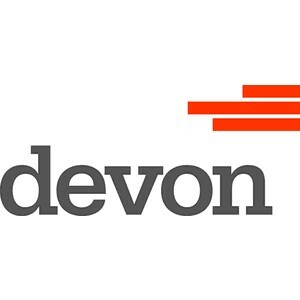 Devon continued to make progress lowering operating costs in the fourth quarter. The company closed on the sale of its 50 percent interest in the Access Pipeline for $1.1 billion in October. This transaction officially completed Devon’s $3.2 billion non-core asset divestiture program. The majority of divestiture proceeds were utilized to retire $2.5 billion of debt. Devon exited the fourth quarter with investment-grade credit ratings and significant liquidity, which consisted of $2 billion of cash on hand and an undrawn credit facility of $3 billion. Devon will also benefit from a significantly increased commodity hedging position in 2017. The company currently has approximately 50 percent of its estimated oil and gas production hedged in the upcoming year and will continue to build out its hedging position in the future.